RIORI Vol. 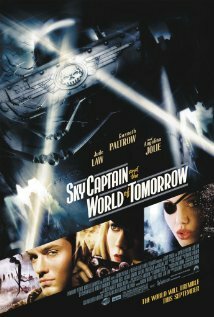 2, Installment 21: Kerry Conran’s “Sky Captain And The World Of Tomorrow” (2004) | "Rent It Or Relent It"
Jude Law, Gwyneth Paltrow, Angelina Jolie, Giovanni Ribisi and Sir Laurence Olivier(?). The world’s cities are under attack by huge robots! Prominent scientists from around the globe have mysteriously gone missing! Who is this fearful Totenkopf being whispered about in the scientific community? Reporter Polly Perkins’ inquiring mind needs to know. So she better enlist an old flame from the past with the skills (and the ride) to get her to the bottom of these mysteries. Calling Sky Captain! Come in, Sky Captain! I think I’ve always had an affinity for old technology. When I first ventured into writing, I started on my grandparents’ old “portable” Underwood typewriter. This so-called portable clunker was the size of and weighed as much as two cinder blocks. I later graduated to my aunt’s hand me down IBM PCII. It was already a decade outmoded when I inherited it. No mouse, floppy disks, the on/off switch at the rear of the CPU the size of a late 70’s VCR and a clunky monitor with no graphics, just ghostly algae-colored letters on a screen. This was in 1992, before God. I had only a Gibson-esque idea what real computers were for or like. My first car was a very used ’78 VW Rabbit. The first video games I played were on an Atari 2600. Hell, I had a sh*t TV with dials on the fool thing. I guess I say I “think” I’ve had an affinity for old tech probably because I didn’t have a choice. Old tech is better than none I suppose. Still, I do enjoy me some old timey stuff. In addition to futzing around with ancient tech like in an episode of Fringe, I also figure this kinship came from frequent visits to my Mom’s parents’ place. Their house was in their family name for what had to be close to a century. The place was not unlike a museum, filled with antiques, old portraits, sterling silverware on the mahogany dining table. Even the backyard garage had its own—albeit nonfunctioning—gas pump. The place kinda stayed in the realm of 1949; nothin’ fancy to plug in. For example, even when there was access to cable television, my Grandfather was faithful to the aerial receiving only seven channels from the reliable New York airwaves (he even went to far as to protect this vital connection by unplugging the TV at night, just in case of lightning strikes. I didn’t get it either). Needless to say, being somewhat unknowingly deprived (no f*cking mouse. In 1992) of newfangled gear and being entrenched in my extended family’s time capsule of a house, I gained an appreciation of stuff-that-was-before-me. It seemed like the producers of Sky Captain were of a similar mindset, and when I caught wind of their highly stylized, retro-minded, full of classic machinery in action, Art Deco movie magic, I assumed it would a sort-of Flash Gordon kinda narrative. Splash and dash and a healthy amount of tongue-in-cheek humor. Hell, look at the freakin’ title already. Dauntless New York Chronicle reporter Polly Perkins (Paltrow) may be onto the scoop of the decade. She’s got a lead from a prominent scientist that his colleagues have all disappeared without a trace, and he may be the next on the list to go missing. All the good doctor knows is who may be behind these vanishings, a dastardly man known only as “Totenkopf.” And before the night is out, Polly’s lead has gone missing himself. Not long after, sirens wail into the night. People scattered onto the streets. Up in the air is the formation of invading planes, ready to rain down on the city. But it’s not planes. Rather, its giant looming robots that crash onto the streets and stomp up and down the avenues, as if looking for something. The call goes out. The city needs rescue from these mechanical menaces (all bearing a peculiar insignia on their chests). It’s up to one man and his air force for hire to halt the invasion: Joe “Sky Captain” Sullivan (Law) and his souped up aircraft at the ready. He handily thwarts the invasion, but only after the robots find their quarry. Generators. Huge electrical ones from the bowels of some felled building. Curious for all the collateral damage. What do robots need with generators? Turns out this isn’t an isolated incident, but most of it has been kept under wraps. Robots of all shapes and sizes have been popping up around the globe for some time now, all bearing that curious emblem, snatching tech and vanishing to elsewheres unknown. Well, the Captain and his crew has got a few leads of their own to follow, and of course Polly has a nose for news. She demands to tag along with Cap to get to the bottom of the disappearances, the robots, who this mysterious Totenkopf is and what’s his aim. So we got ourselves a mystery, a fearless pilot, a reporter with some moxie and lot of globetrotting ahead. Let’s take to the skies…! I wasn’t completely let down by Sky Captain’s promise of CGI-rendered classic tech. It sort of was what I expected. Kind of a Jules Verne meets Will Eisner meets Max Fleischer meets Jonny Quest vibe going on here. Captain’s a visual treat, to be sure, but it’s kind of a muted treat. In fact, most of this movie seems muted. I liked this movie; it was fun. However throughout my viewing, I could not but help thinking that writer/director Conran was holding back on us. Yes, the visuals were stirring (I loved the lighting, CGI or no), the score was majestic, the acting was charming and the overall story read like something out of a Golden Age comic book. Fine, fine. The issue I take is that the whole movie felt confined. No, not confined. Compartmentalized. Each arc of the story didn’t really feed seamlessly into the next. Hence the comic book allusion. Frame by frame. Going through the numbers. Couldn’t get it into gear. Pick whatever analogy you like. It’s like Captain was a firework ready to blow and someone just cut the fuse. There just wasn’t a lot of verve you’d expect from a movie titled Sky Captain and the World of Tomorrow. It was more like Sky Captain and He’ll Eventually Get That Plane Reaching for the Heavens. It wasn’t as if Captain wasn’t trying to reach for something more. There is an underscore of big deal, grand, gee whiz bucky gizmo threading through the movie. Like I said, it’s reaching. Captain’s trying to be over the top, but it never seems to reach it. I had this desire to get some “more” here, whatever that more was (robots, I hoped) and it didn’t happen. Conran screwed the pooch on a movie with a lot of potential. But don’t get me wrong. Like I said, overall it was fun. And there are a lot of nice touches throughout. For instance, the editing was excellent. Despite the paint-by-numbers pacing, how the scenes played out when Conran wasn’t hitting on the Robutussin were great, as was the cinematography. I know camera placement ain’t no real thang in a CGI-rendered movie, but most angles were executed quite well here (or at least programmed well). You know what the style of Sky Captain reminded me of most? Rotoscoping. Back in my bilious review of A Scanner Darkly, I pointed out that this particular animation was the guts of that film in how it was shot. For those out of the know, rotoscoping is an animation technique in which animators trace over footage, frame by frame, for use in live-action movies. It was used a lot in the old Superman serials from the 40’s. With the lighting as it was, the actors and sets in Captain looked very close to cartoony, but not in a goofwad after school way. I guess this was an homage to the serials and comics that must of inspired this movie in the first place. There’s a light-heartedness to Sky Captain that I found endearing. It’s kinda goofy, as if the actors are quite aware this little trifle is a riff on the tried and true Indiana Jones model, with planes. And robots. And Sir Laurence Olivier back from the dead (really!). But it’s got a lot of light humor I dig. Not self-effacing, but definitely tongue-in-cheek. Angelina Jolie with an eye patch and working her best British/Lara Croft accent? Come on now. Get hip. The acting was as best could be called a lark. To review, Law tried to play the Captain in a combo of Indy and soft-spoken WW2 fighter pilot…with an ulcer. He was slick and smooth but not as rough and ready as most heroes of that ilk are to my liking. He definitely didn’t have a way with the ladies. It’s inferred that the Cap and Polly once had a relationship that fizzled out over something to do with his plane, but that’s about as far as it goes. And Paltrow is a prime example of “I got my Oscar, now let’s have some fun” (like almost every movie Pacino has made in the past twenty years. Zing!). Her Polly Perkins may get aggravating sometimes, and she plays that my girl Friday thing to the hilt. But it works, if you just go with it. It’s a stereotype that fits in with the movie’s motives, so I’ll give it a pass. I particularly liked Ribisi as Cap’s version of Scooter from the Muppets (“Shazam!”) with him tooling around with the retro gadgets he cooks up. If he was the deliberate comic relief, then good, but the film was comic enough without him. This coulda been a summer movie, but it would have been too…what’s the word?…constipated to compete with Marvel’s next cinematic endeavor (Damage Control: The Movie! Now we’re really scraping the bottom here) or whatever Michael Bay plans to blow up for 100 minutes. There’s this feeling of (in a Monty Python way) “Get on with it!” that sticks with Captain for too much of the film. Still, it remained fun, even for an Indiana Jones knock-off. It had cool aircraft. It had robots. It had rocket ships. It had a ridiculous plot was five degrees off campy. All it needed was a little Red Bull to really leap to life. Did I mention it has robots? Rent it or relent it? A very mild rent it. It’s got a lot going for it, but Captain has a hard time getting there. If at all. It’s true. The spire atop the Empire State Building was originally designed as a mooring for airships. What designers failed to anticipate were the powerful updrafts caused by the virtual canyon created by the skyscrapers up and down Manhattan. Science! For those keeping track, “Totenkopf” means “dead head” in German. Come hear Uncle John’s band. I saw the Buck Rogers comic book there! Don’t get all meta on me! We explore The Life Aquatic, With Steve Zissou as our guide. This entry was posted in Action/Sci-Fi and tagged Angelina Jolie, Giovanni Ribisi, Gwyneth Paltrow, Sir Laurence Olivier. Bookmark the permalink.